The service agreement comprise of these service conditions, the general data processing agreement referred to under paragraph 22 and the standard conditions concerning the product ordered in accordance with the web page of the product. The contract is entered into between PRO ISP AS (hereafter called PRO ISP) and the legally liable party as per with the order form (hereafter called the User). The User accepts these terms of service by checking the checkbox "I have read and accepted PRO ISP's service agreement". The contract is entered into once the User has completed the ordering process via PRO ISP's order pages and has received an e-mail confirmation stating that PRO ISP has received this form. PRO ISP reserves the right to reject any order provided that this right is utilized within 2 days following receipt of the e-mail confirmation by the User. PRO ISP offers the User the potential to save electronic data on its servers so that others can access this information electronically via the Internet using the protocols and methods available in the service. The User also has the potential to send and receive electronic mail (e-mail) and in other ways communicate via the Internet and PRO ISP's systems when the User uses a service where this is part of the service offering. PRO ISP will invoice the User for these services in accordance with the prices for the services that are applicable at the time. The User shall be responsible for ensuring that the necessary equipment, such as a computer and modem, is present in order to connect to the Internet. The User must have access to the Internet and pay for any telephone charges or other fees that may accrue as a result of this connection. The User must also pay for any costs for access to necessary software. By using this service, the User commits himself to register correct, complete and current information about the User when PRO ISP requests such information. The User commits to updating and maintaining this information so that it is current at all times. The User shall be obliged to continuously inform PRO ISP of any changes in the User's home address and/or e-mail address. Insufficient information concerning changes to the User's home address and/or e-mail address will be considered to be a significant breach of PRO ISP's service conditions, and PRO ISP shall reserve the right to exclude the User from the service and to immediately terminate all relationships that the User has with PRO ISP. Under no circumstances shall PRO ISP release any of this information to a third party unless the User has given written permission for this or if PRO ISP is required to forward information about the User due to a court order. If PRO ISP discovers that the information given by the User is wrong or incorrect, PRO ISP shall reserve the right to exclude the User from its services and to immediately terminate all relationships that the User has with PRO ISP. In such cases any outstanding balances shall not be refunded. PRO ISP reserves the right to change the conditions of this document at any point in time. If such a change occurs, PRO ISP shall inform of this change via their website and also to the customer via e-mail. At any given time the customer shall be responsible for ensuring that PRO ISP has correct information concerning communication channels to the User. If the User does not accept the new conditions of the service, he shall have the opportunity to terminate the User's use of the service at that time. By continuing to use the service, the User accepts the new conditions for use of the service. The User commits himself to the conditions that are stated here for use of the service. As far as possible, PRO ISP shall attempt to keep the service available 24 hours a day, 7 days a week. PRO ISP cannot be held responsible for any losses that the customer may experience due to lack of access to the service. PRO ISP reserves the right to terminate or change the service if continued operation is not secure. PRO ISP shall have no obligations to third parties if PRO ISP utilizes its right to change or terminate the service. A user account will be created with your own username and password when you become a User of the PRO ISP services. The User shall be held responsible if these are not kept secret. The User shall also be responsible for all actions performed via the user account. The User shall be obliged to inform PRO ISP at any given time if the User becomes aware of unauthorized use of his user account or other activities that constitute a security risk. The User understands and accepts that use of the service is performed at the User's own risk. The service shall be provided as and when it is available. PRO ISP cannot guarantee that the service will meet the demands of the User or that the service will be uninterrupted, secure or free of error. The User understands and accepts that the material downloaded or uploaded, or in any other way received or sent via use of the service, is done so at the User's own risk and that PRO ISP is not responsible for any errors, damage or loss of data that occurs to the User's data processing system when using such material and/or data. PRO ISP shall bear no responsibility concerning products or services that are ordered or received through this service or any transactions that are made via this service. The User acknowledges that PRO ISP does not approve the content of the communication that the user submits via the service and that PRO ISP does not bear any form of responsibility for any threatening, illegal or in any way offensive material that the User receives via this communication. Neither shall PRO ISP be responsible for the violation of third parties' rights nor criminal acts that may arise during use of this service. Content on the User's websites must comply with Norwegian legislation at all times and PRO ISP may not be held responsible in the event that the User does not observe this. PRO ISP reserves the right to close the User's account(s) without further notice if it becomes aware that this is not the case. The User acknowledges and consents that PRO ISP, its employees, owners and affiliated companies are not legally or financially liable for any legal prosecution to which the User may be exposed due to unlawful or illegal use of the service. No verbal or written guarantee may be given that is not stated in this document. The User may resell the services purchased from PRO ISP. PRO ISP must be informed before such resale may be performed. In addition, PRO ISP must issue an approval for such resale to be approved. The User may resell the service at the User's own prices. The User shall be obliged to pay PRO ISP the prices applicable at any given time for the services ordered, even if they are resold and used by a third party. If the User does not pay for the service, PRO ISP may close the service in accordance with the conditions in point 14 in this contract. 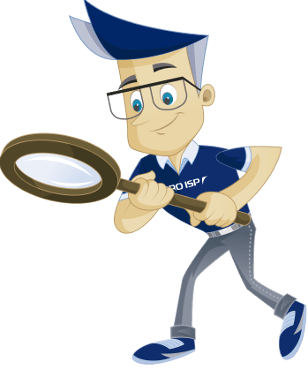 PROS ISP shall not be responsible for deletion or any other errors that result in the User's messages or data being lost from the system. PRO ISP has not set an upper limit on the number or volume of sent or received messages, however it reserves the right to decide whether the User's use of the service is in compliance with the conditions of service and may ban the User if PRO ISP decides that the User's use is not in accordance with these conditions. The available storage volume in and data transfer from the respective accounts are described in the product information. Overuse will be invoiced at the User's expense. Other limitations to the respective accounts may arise. The User shall be solely responsible for the content in his messages and for the information sent via the service. The User's use of this service is subject to all local, federal and international laws and regulations. The User understands and agrees not to use the service for criminal acts, not to interrupt, destroy or sabotage PRO ISP's service or networks connected to the service and to behave correctly in relation to all rules and procedures governing connected networks. The service uses the Internet to send and receive messages and information. The User's use of the service is therefore subject at all times to the regulations that apply to the Internet. The User must not to use the service to send chain letters, "spam" e-mail or other distribution lists to persons who have not given specific information stating that they desire to be included in such services. The User will not use the service to store illegal material. The User understands and agrees not to send or publish illegal, harassing, obscene, threatening, vulgar or in any other way offensive material in any form. In addition, the User understands and agrees not to send or publish material that encourages conduct that conflicts with Norwegian or international laws or regulations. Attempts to acquire access to other companies' data processing systems are not permitted. Under no circumstances may the User conduct actions or transmissions that would constitute a disproportionately large burden on PRO ISP's servers and technical infrastructure. PRO ISP reserves the right to remove content such as zip, MP3, jpg and similar in we hosting services in the event that these overload the servers to an unreasonable degree. The purpose of PRO ISP's web hosting service is not to act as an external hard disk for the storage of large volumes of files for free downloading or exhibition but to act as a presentation and/or sales location for physical and legal entities. The User shall not destroy or violate other users' use or enjoyment of use of the service. Although PRO ISP permits free traffic in all its web-hosting services, PRO ISP reserves the right to cancel the User's subscription or to set limits on the User's traffic in cases of gross abuse. Gross abuse may, for example, include a breach of the rules in point 10 with the consequent result of a disproportionately high traffic flow. A subscription runs for 12 months at time (a "subscription period"), unless otherwise stated, and may be cancelled by the User at any time with a minimum of 1 month's notice prior to the expiry of the subscription period. For example, if the User has taken out a subscription on January 1, 2005, the subscription shall be valid until December 31, 2005. If the customer does not wish to renew the subscription for the following year (2006), the subscription must be cancelled by November 30, 2005 at the latest. Cancellation must be performed via PRO ISP's website (www.proisp.eu). The service is an ongoing subscription, which runs until the notification of cancellation is received from the User. PRO ISP shall not be responsible to third parties if the service is cancelled. If the User is, or becomes dissatisfied, with the service or the regulations in this document, the User must act in the following manner. The User must immediately end use of the service, close the User's account and notify PRO ISP of the end of use. PRO ISP is not obliged to notify the User that the relationship will be/or has been terminated if no alternative contact methods via the Internet or post (for example an alternative e-mail address) are given in the User's personal information. Upon end of use of the user account, the User's rights of use of the service shall cease. The User shall have no rights to receive, and PRO ISP shall have no responsibility to forward, unread or unsent messages and information to the User or third parties. All messages to or from PRO ISP must be made in writing via e-mail, via PRO ISP's customer pages (www.proisp.eu) or via normal post. PRO ISP may issue messages via the service if PRO ISP believes that this is necessary to inform the User of changes in the conditions of use of the service or other topics of importance for the service and its users. The User can receive operating information from PRO ISP through selected communications channels if desired. The User understands and accepts that PRO ISP shall not be responsible for loss of data that is due to interruption or destruction of the service in any manner. The User shall be responsible for backing up the User's data stored on PRO ISP's servers. The User agrees to pay the applicable fees set for the service at all times. PRO ISP will issue advance invoices to the User for use of the service 1 'one' month before the start of a new product/service period. 14-day payment terms apply to the User unless otherwise agreed. The User acknowledges that products/services will not be ordered or renewed with any third parties before the User have paid the invoice. This includes, but are not limited to, domain names, SSL certificates, licenses and similar. PRO ISP is not responsibel for the User's loss of domain names or any other losses incurred as a result of payment after the due date. In the event of late payment, the User will receive a reminder from us by email 7 days after the due date of the invoice. If payment is not received 14 days after the due date of the invoice, the User acknowledges that the product/service may be suspended. If payment is not received more than 30 days after the due date of the invoice, the User acknowledges that the product/service may be deleted. Interest will be applied to late payments according to act concerning interest on overdue payments. PRO ISP's right to add late fees are regulated by the Norwegian debt collection laws. PRO ISP reserves the right to transfer claims to third parties. If the User wishes to take advantage of the 30-day refund guarantee, the User must inform PRO ISP within 30 days from the date the order was placed. PRO ISP shall issue invoices via e-mail to the e-mail address given by the User 1 'one' month before the start of a new product/service period. The User will also receive the invoice by EHF, eFaktura or letter depending on if the User has opted for any of those options. The User acknowledges that invoices by letter incurs an extra fee. PRO ISP issue reminders, and collection notices and demands via e-mail. PRO ISP shall not be responsible for the Users' receipt of the sent e-mails. The User will pay all fees related to the payment if the User pays via bank transfer from outside of Norway. Upon utilization of the right of cancellation, PRO ISP shall withdraw the right of use to the service, and the amounts paid by the User will be refunded with the exceptions stated in the points below and any rules of law applicable to this area. The right of cancellation is valid for 30 days from the time of order. The service is delivered once the domain has been registered in the domain register, and therefore the service cannot be cancelled after this time even if the 30-day deadline for the right of cancellation has not elapsed. If PRO ISP receives the cancellation before the domain has been registered and before expiry of the right of cancellation deadline, the User's payment will be immediately refunded. Application of the right of cancellation can be made in writing via post or e-mail if PRO ISP approves reimbursement in this manner. The User understands and accepts that all content on the pages of PRO ISP and our advertisers belong to the individual companies and all use of this material must be approved by them. This means that the User may not copy, reproduce, distribute or save related work from content found on these pages without the written approval of the individual companies. All trademarks are copyright protected by their respective owners and all rights are reserved. Neither party shall be deemed in default or shall hold the other party responsible for any failure or delay in the performance of its obligations under this Agreement in the event of an event beyond the control of any of the parties provided that the party relying upon this section have taken all reasonably necessary steps to mitigate the effects of the event. Such an event includes, but are not limited to, labor strike, lockout, power outage, earthquake, flood, war, terrorism or any other event that may be deemed as force majeure. Should the force majeure event persist for a period of more than 30 (thirty) days, PRO ISP may at its option terminate this Agreement. Microsoft may demand a license audit through their patners on virtual servers to verify that all software from Microsoft have been licensed correctly. The User is obligated to help Microsoft in any way necessary to ensure that such an audit can be performed as Microsoft requires. The User acknowledges that all software from Microsoft must be licensed through PRO ISP. The User is responsible for making sure that all software that is used on the server is licensed correctly. The User is responsible for any expenses that incur for PRO ISP as a result of illegal use of software or unlicensed software on the User's server and must pay said expenses. The headings of the points in this document are merely an aid and have no legal significance. The parties' rights and obligations according to the contract are determined in their entirety by Norwegian legislation. The parties adopts Stavanger District Court as a court of law. If a dispute between the parties arises concerning interpretation or the legal effects of the contract, PRO ISP may demand that the dispute be settled through negotiation. If such negotiations do not occur, each of the parties agrees that the dispute shall be settled with immediate effect in a court of law. In accordance to law of 14th of April 2000 nr 31 on processing personal data, Regulations of 15th of December 2000 nr 1265 and Regulations 2016/679/EC (General Data Protection Regulation) we provided this data processing agreement. Data processor is PRO ISP AS and Client is data controller. The data processing agreement is an addendum to this service agreement, and is accepted in its entirety when entering into this agreement.